As part of our regular chart updating the latest set of the US NOAA charts is now available for our SeaNav US apps. There are over 40 new charts including new detailed coverage for the whole of Lake Champlain in VT (much requested) , Lake Mead and Lake Tahoe in CA, The St Lawrence river up to Brockville in NY and several new approach scale (5) maps for areas in the Great Lakes (MI). 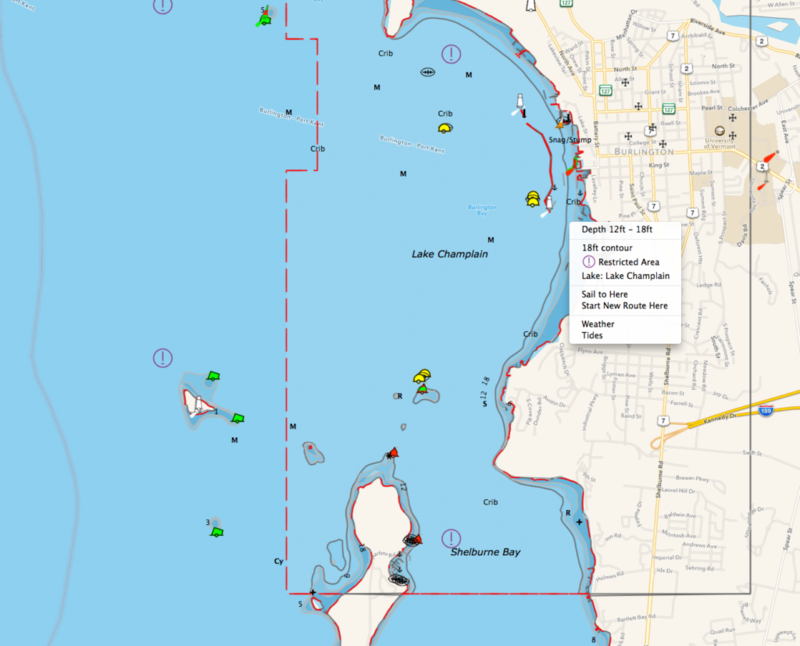 Here is a screenshot of the new Lake Champlain chart around Burlington. The newest member of the SeaNav app family brings our acclaimed marine charts to Mac – letting you explore and plan your boating trips on your Mac, then export your route to your iPhone for navigation while at sea – or plug in a GPS unit, and navigate with your laptop and our hi-res vector charts. SeaNav for Mac US has the latest NOAA ENC Digital Vector Marine charts covering the whole of the USA and Great Lakes, SeaNav for Mac UK has the latest UKHO UK and Ireland vector charts. SeaNav for Mac is exclusively available on the Mac App Store. Includes NOAA US Coastal, Great Lakes and USACE Inland Charts. Buoys, lights etc. are tappable with bearing and distance. Route Planning and tracking with Waypoints, SOG, COG, ETA etc. SeaNav uses the latest Digital Vector charts providing a wealth of benefits and advantages over raster charts. Buoys, Lights, Bridges, Depth Contours, Depth Soundings, Rocks, Anchorage areas, NOAA Weather Buoys etc. are all selectable and have real time distance, bearing and detail information. Turn off layers to de-clutter the display and only show what is important at the time. Tides, moon and sun times and weather are also all available at your fingertips. SeaNav is also available for iOS, so you can plan a route on your Mac and share the route with your iPhone or iPad – or take your iPhone sailing, then send your track back to your Mac. Plug in your GPS unit and go – SeaNav works with Bluetooth and serial GPS units, and those which provide location or AIS service via TCP or UDP or TCP, including devices from Lowrance, Simrad and B&G GoFree. But GPS is only required for real time route navigation, you can plan routes without GPS then send them to your iPhone for use while at sea. SeaNav’s optional Real time AIS, Tides and Weather information require an active internet connection. Your purchase of SeaNav includes 12 months free updates to the included US chart set. SeaNav for Mac is exclusively available on the Mac App Store. 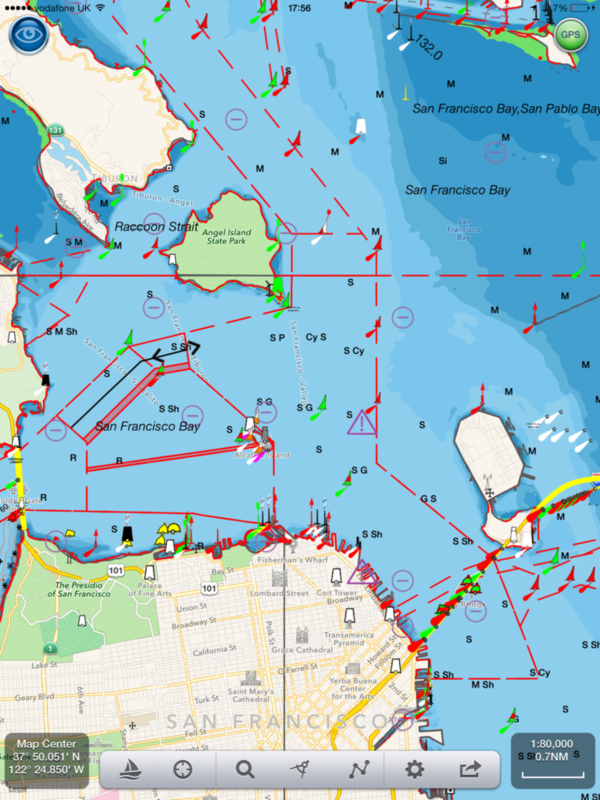 Navionics have launched a new version (7.0) of their Navionics Boating app which now includes free US NOAA vector charts. 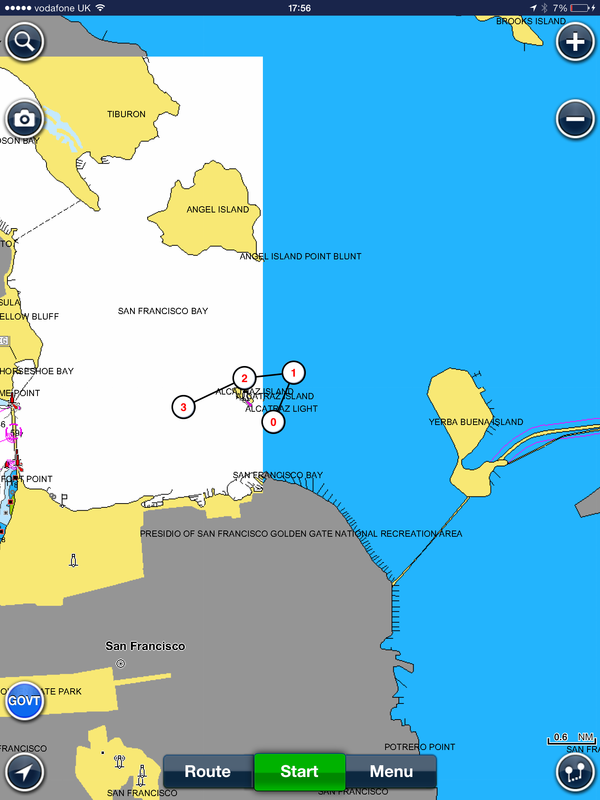 If you are boating in the US you can now get a well respected and functional marine navigation app on your iPad and iPhone without spending a cent. What are they up to? Why should you go anywhere else? 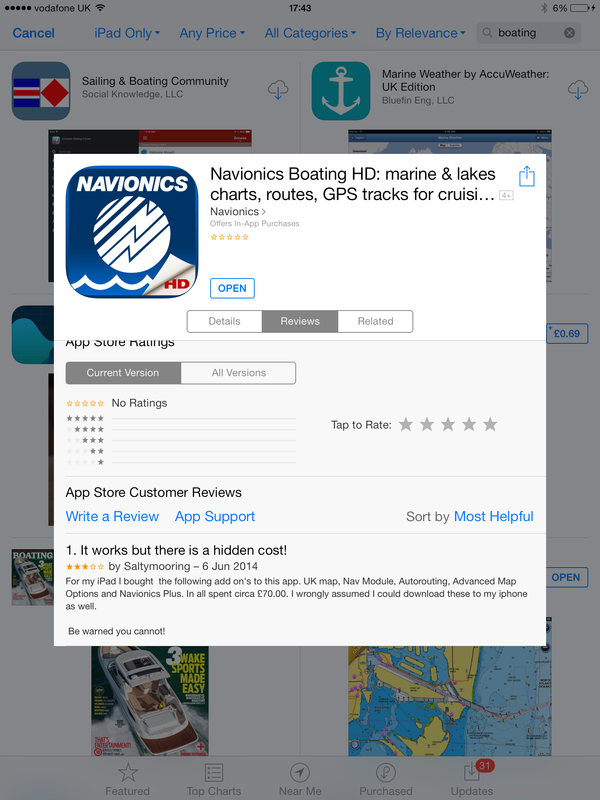 How can they give away a full blown marine navigation app for free? 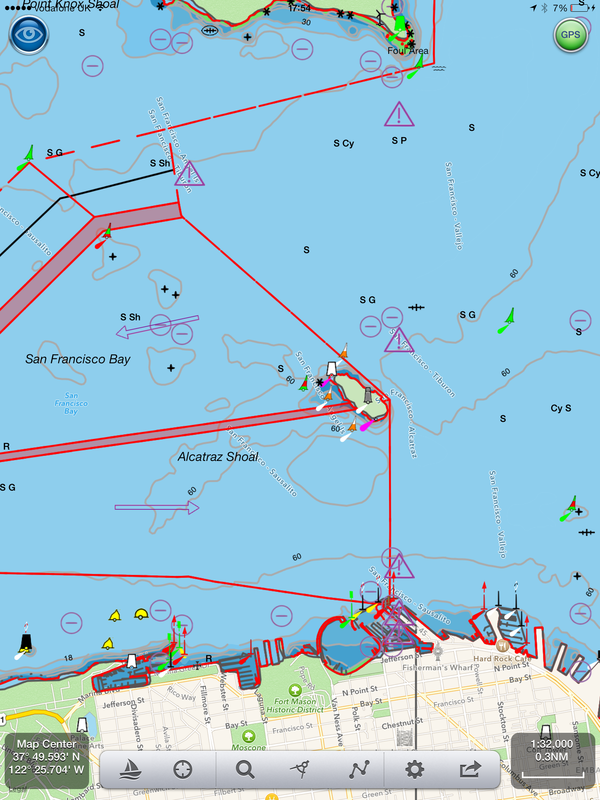 We hope the following comparison and charts around San Francisco can help you decide which route to follow. We hope you will agree that its a lot less cluttered, has more relevant information and is a lot easier to view. Zoom in and more details and spot depths will be shown. You can also choose what level of detail to show in SeaNav. 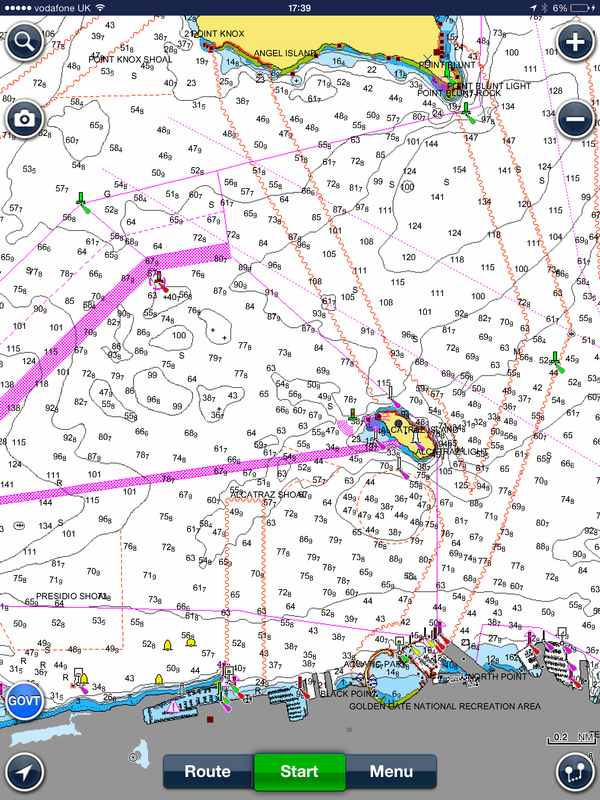 SeaNav includes full live navigation features including COG, SOG, HDG, ETA, Waypoint distance and time, Cross Track error, Course and North up view etc. 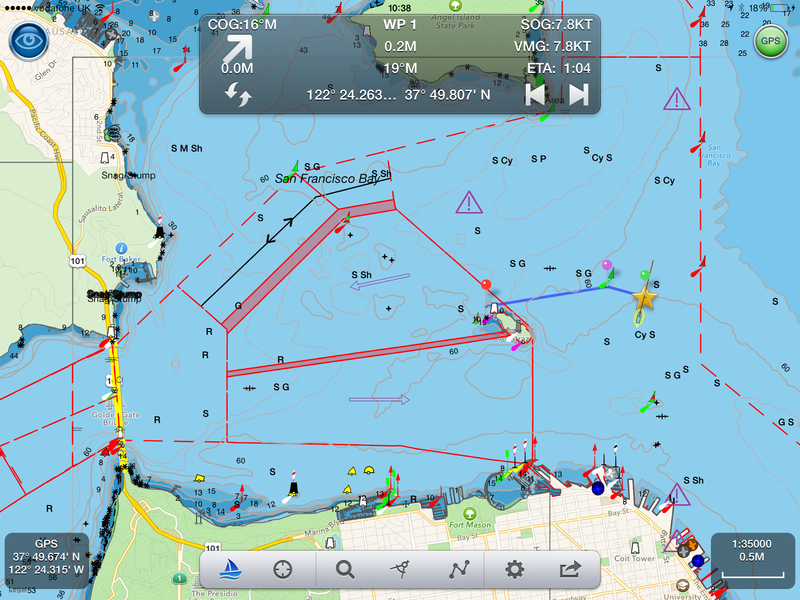 – it’s at least a $5 extra for Navionics and that doesn’t get you much of what SeaNav offers. 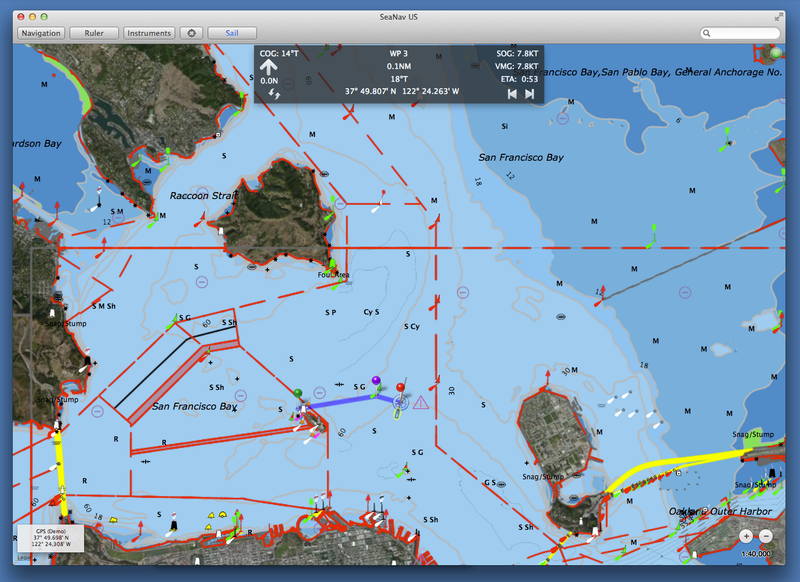 SeaNav includes Tides – Navionics Boating free doesn’t – you have to buy their USA chart set at $70. SeaNav has a unique and highly recommended AR Camera view showing buoys, ships, landmarks etc. overlaid on the real time camera view. SeaNav has free support for the amazing fully waterproof Pebble SmartWatch – forget a $500 Garmin Quatix! SeaNav has live AIS Ship data overlay including collision detection. (via Boat Beacon). SeaNav – buy once and runs at full HD on both your iPad and iPhone with no need to purchase another version. And, SeaNav iPhone and iPad is now available for you to try for free. Click here to learn more.